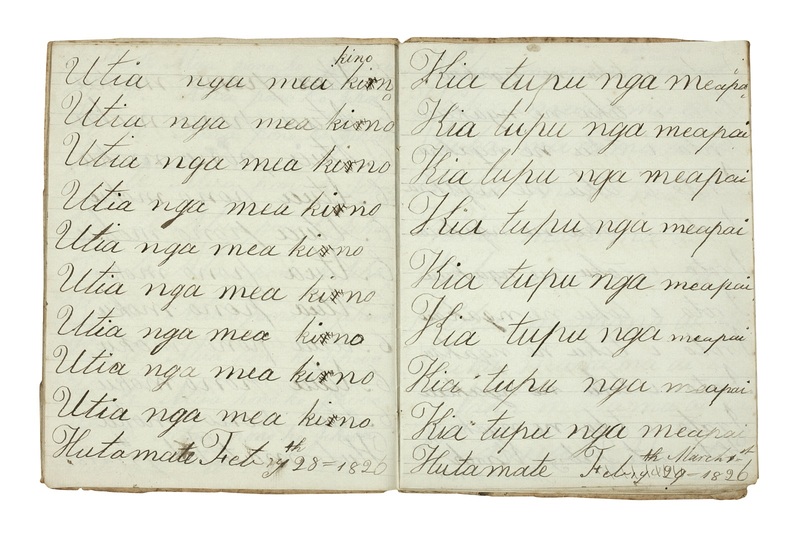 To mark Te Wiki o Te Reo Māori, Māori Language Week, for 2015 here at Heritage et AL we are featuring some of the oldest items in our collections relating to te reo Māori. These taonga are all held in Sir George Grey Special Collections and currently on show in our exhibition space on the second floor of the Central Library as part of our exhibition Pūtahitanga: a meeting of two worlds in the North, 1769-1842. The arrival of Captain James Cook in New Zealand in 1769 is usually seen as the beginning of the meeting of two worlds – the Māori and the European – leading to increasing interaction, misunderstanding and understanding, cross-cultural movement and exchange. This exhibition reveals some of those interactions with explorers, sealers and whalers, missionaries, traders and settlers in the documents and books produced at the time and held in Sir George Grey Special Collections. The word Pūtahitanga means a confluence of streams and expresses the fluidity of this period. We end the exhibition in 1842, two years after the Treaty of Waitangi and the move of the capital to the new settlement of Auckland, and three years before the first major conflict erupted in 1845. 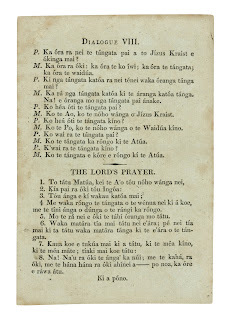 Ref: Ko te katekihama III, Kerikeri: Church Mission Press, 1830, Sir George Grey Special Collections, Auckland Libraries, GNZM 7. The first item ever printed in New Zealand is this very modest production by the missionary William Yate, printed in Kerikeri in 1830. Only two known copies survive now. The text is a Māori translation of the catechism, a summary of the Christian doctrine. 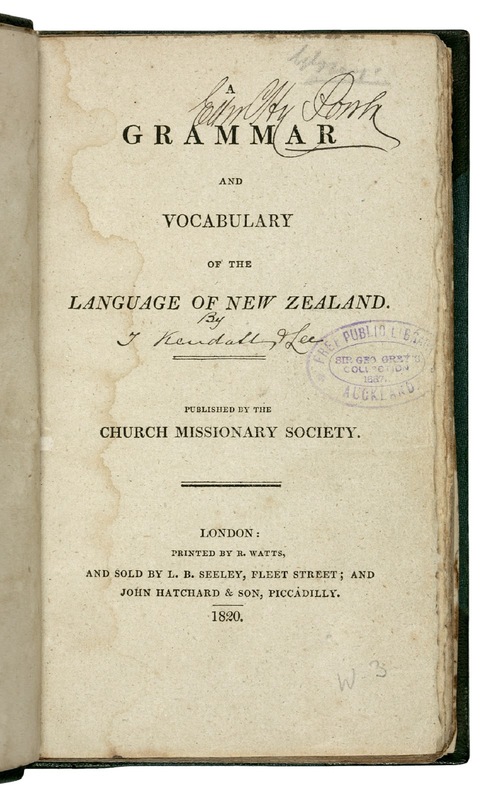 Ref: Thomas Kendall, A grammar and vocabulary of the language of New Zealand, London: R Watts, 1820, Sir George Grey Special Collections, Auckland Libraries, GNZM 3i. 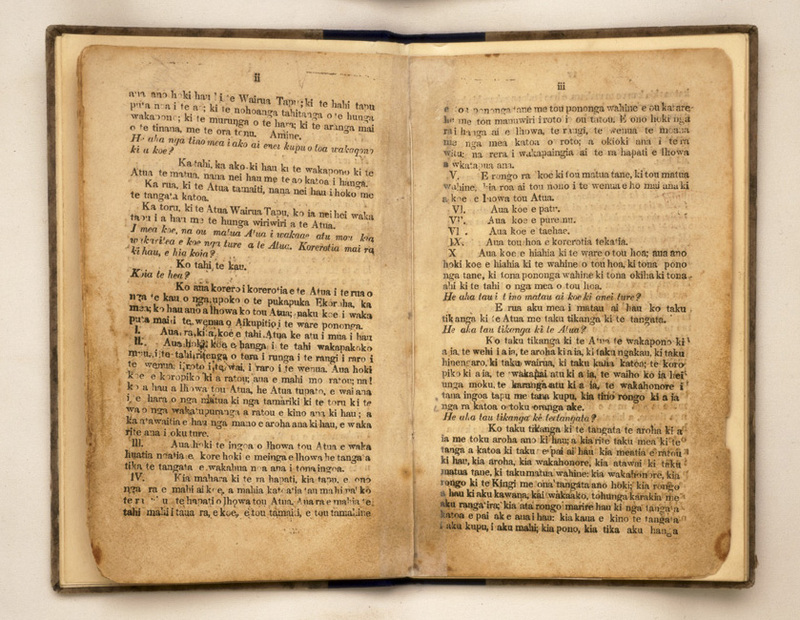 The writing down of the Māori language, te reo Māori, began with the vocabulary lists collected on Captain Cook’s first voyage. 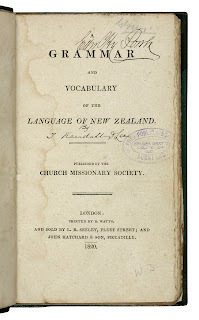 The desire of the first missionaries to teach Māori Christianity, and the desire of Māori to harness literacy, propelled the publication of the first grammars. 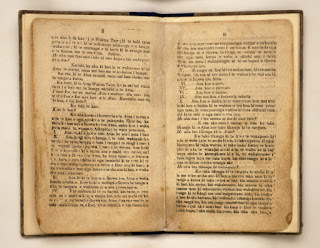 The earliest was compiled mostly by the mission teacher Thomas Kendall, and printed in Sydney in 1815. This is his second more ambitious production, published in London in 1820. 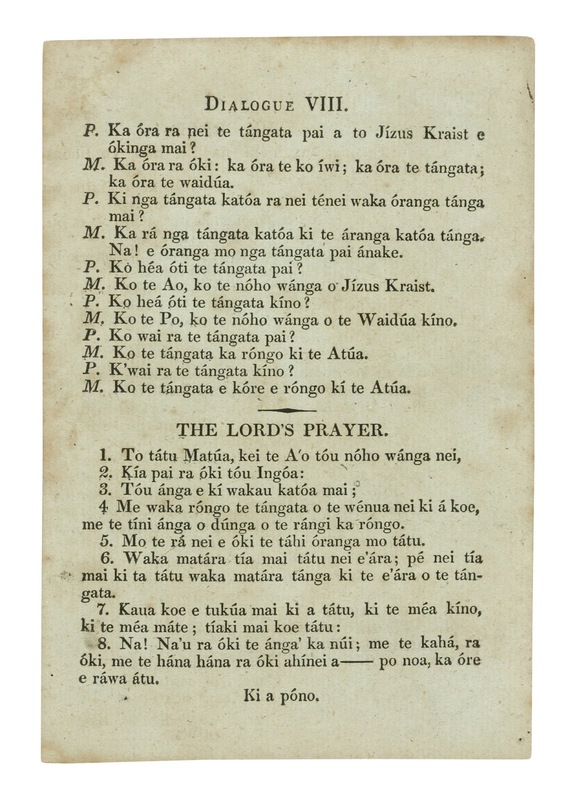 It was a collaboration between Kendall, the Cambridge linguist Professor Samuel Lee, Tui and Te Tiri, who had travelled to England in 1818, and the chiefs Hongi Hika and Waikato, who had accompanied Kendall on his trip back to England. 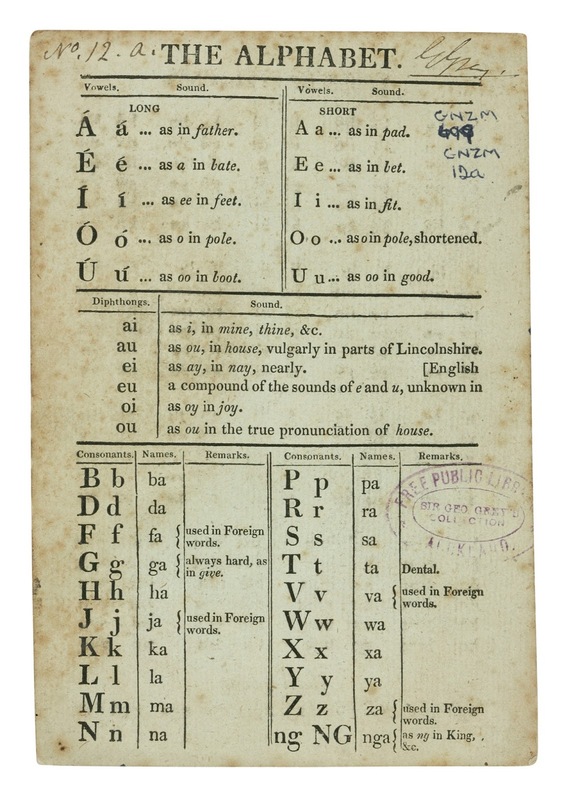 These double-sided cards are extracts from the 1820 grammar, produced for teaching purposes. They were used by John King and Thomas Kendall in the Rangihoua school, which was established by Marsden and Ruatara. 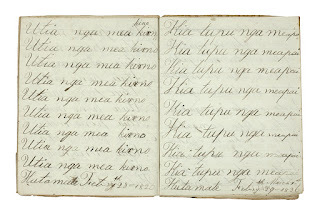 Ref: Hutamate, Copy Book, 1826, In Maori copy books, Sir George Grey Special Collections, Auckland Libraries, GNZMMS 19. 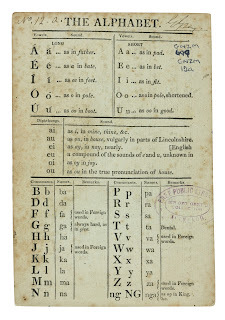 The writing exercises in this book were copied out by one of the pupils at King’s school in 1826. He has signed his name Hutamate and dated each page. By this time Thomas Kendall was no longer teaching at the school, having been dismissed from the Mission for his outspokenness as well as for an affair with a Māori woman. A literal translation of this page reads: ‘Extract the malignant to enable beneficial growth… in my heart’. The exhibition was curated by Kate de Courcy, Robert Eruera, Iain Sharp and Georgia Prince.